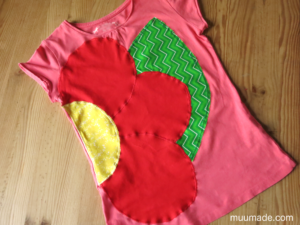 This is a tutorial on how to make a waist pouch from a pocket. 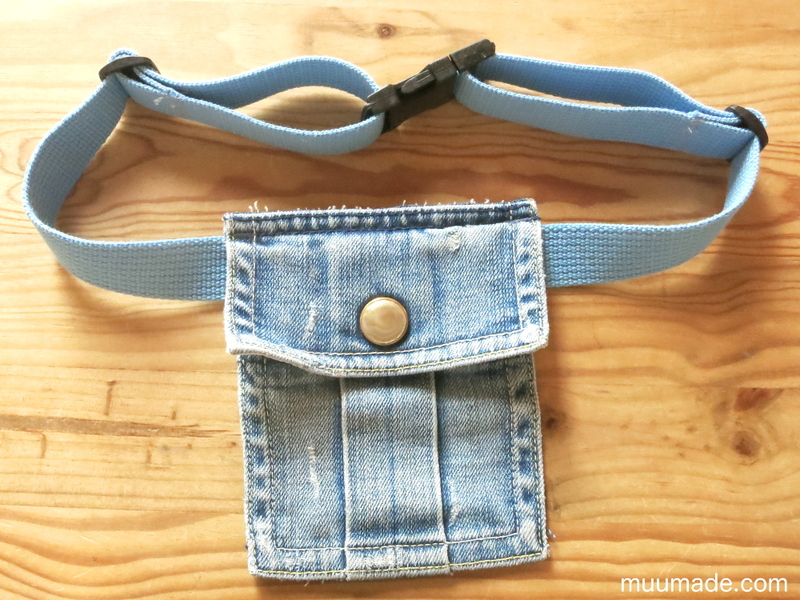 The finished waist pouch is a practical and fun accessory. 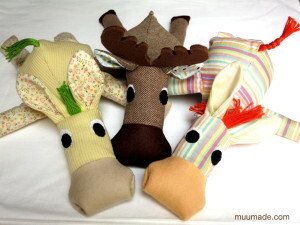 You can use it to carry around small essentials, such as keys, coins and cell phones. 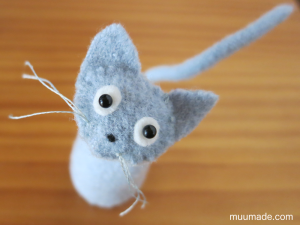 This project is also a great way to upcycle an old pair of pants. 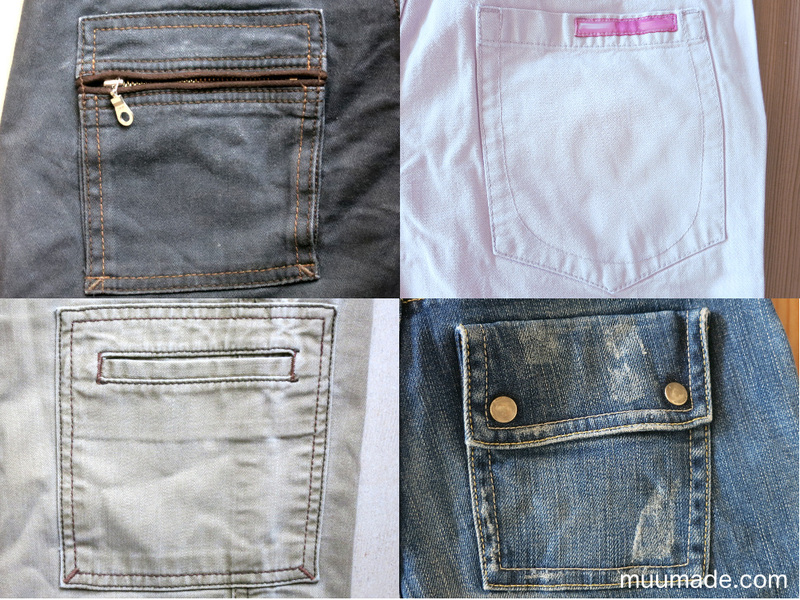 They might have become too worn to serve as pants, but their pockets can live on! 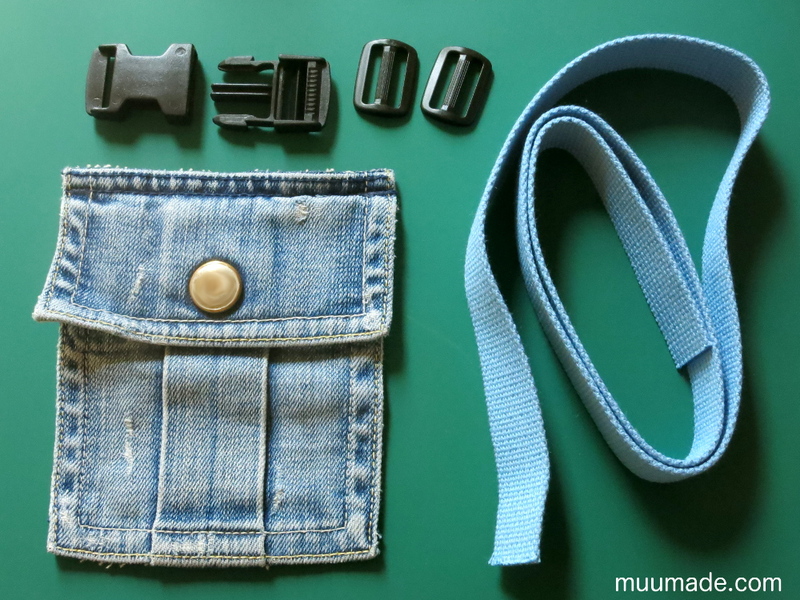 The pocket can be of whatever size and shape you like, but I recommend that you select one with an opening along the top, for easy access once it is converted into a waist pouch. 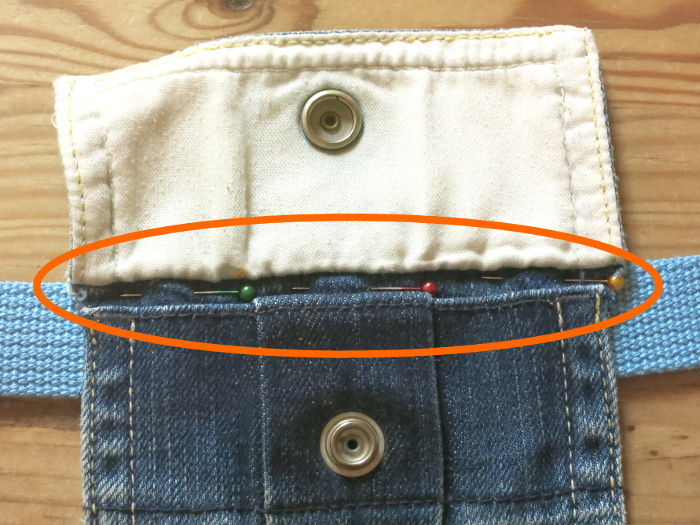 If the pocket has a flap or a zipper, it is even better! 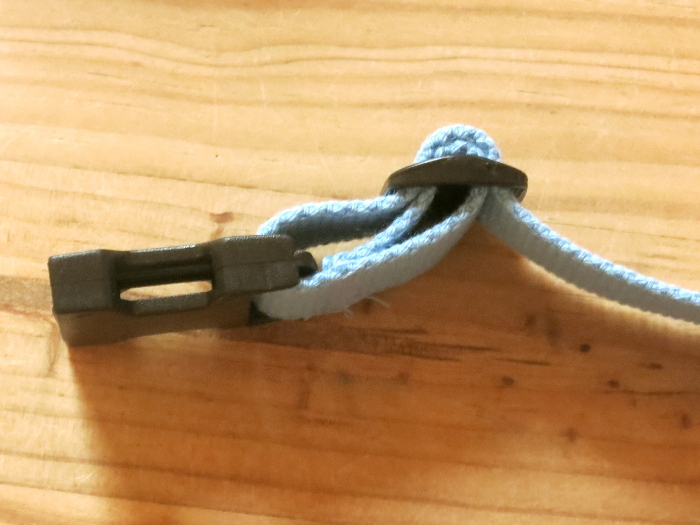 1 pair of side-release buckles (in the size that fits your webbing). 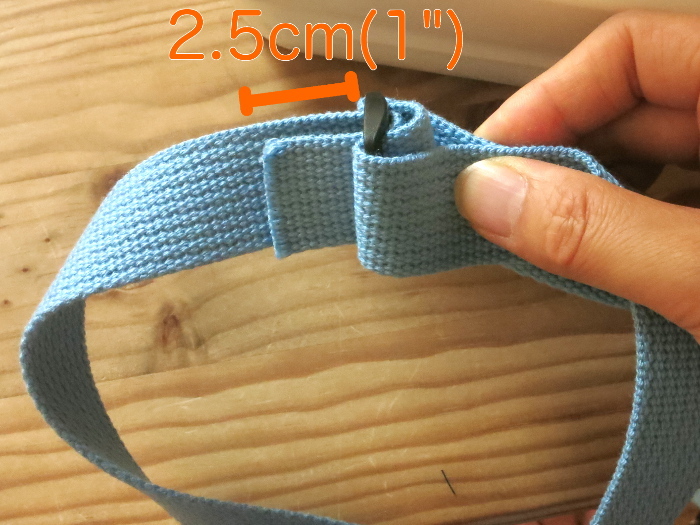 *I used cotton webbing with a width of 2.5 cm (1″), but you can choose whatever width you like for your waist pouch. 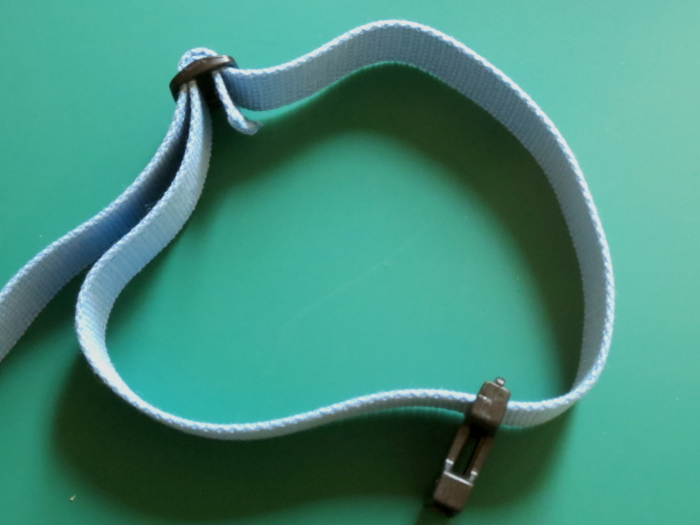 Eco tip: In addition to upcycling old pants, you can also reuse buckles and sliders from old bags to make a new waist pouch! 1. 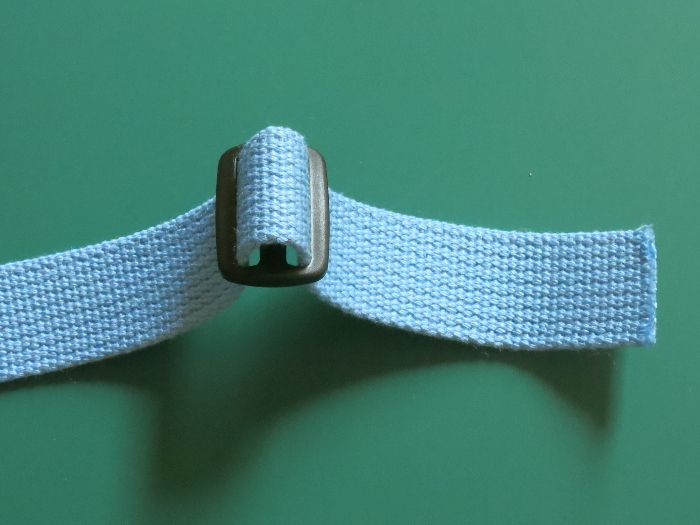 To make a waist band that is adjustable, first insert the cotton webbing into one of the sliders. 2. 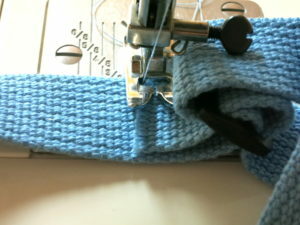 Then, slip on one of the buckle pieces. Hold the webbing so that the buckle piece is on the right of the slider, as shown in the photo. 3. 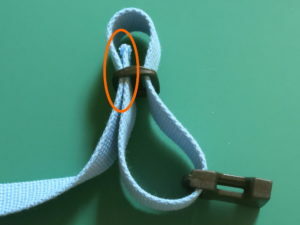 Bring around the end of the webbing which has the buckle, and pass it through the left slit of the slider, as shown inside the orange circle in the photo. 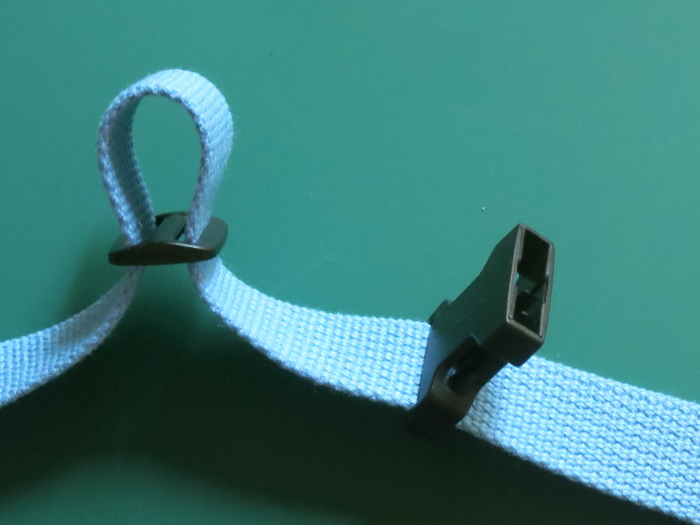 The buckle piece should now be on the loop of the webbing that you just created. 4a. Pass the same end of the webbing through the right slit of the slider. 4b. While keeping the loose end in place, make the loop of the webbing (with the buckle inside it) bigger. 5a. You are about to sew the loose end of the webbing onto itself to permanently attach it to the center of the slider. 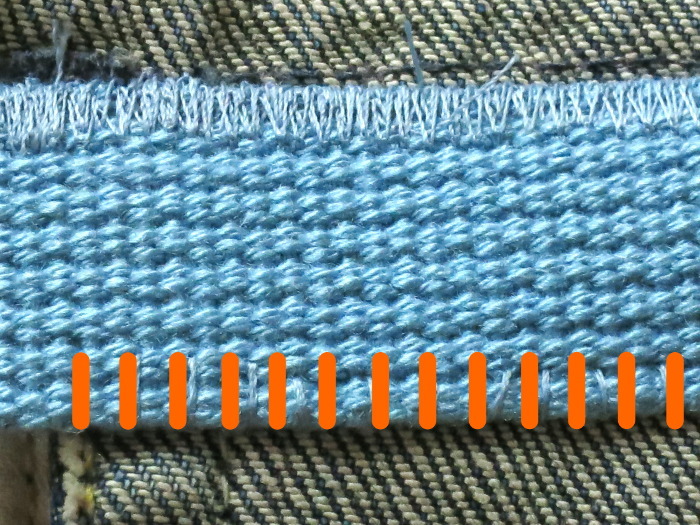 Pull the loose end out of the slider until there is approximately 2.5 cm (1″) between its edge and the slider, as shown in the photo. 5b. 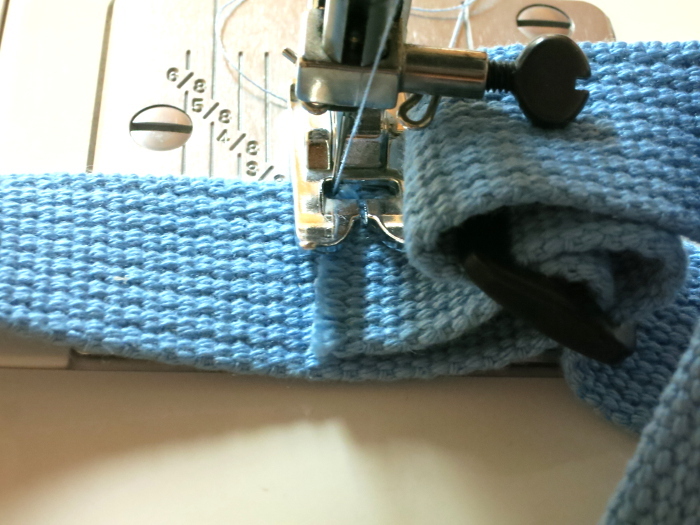 Prepare a sewing machine with thread in a color that matches the webbing. 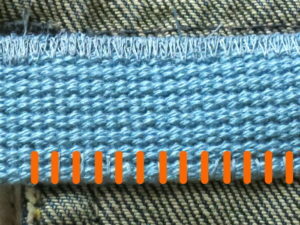 Sew along the edge of the loose end, across the full width of the webbing, as shown in the orange circle in the second photo. 6. 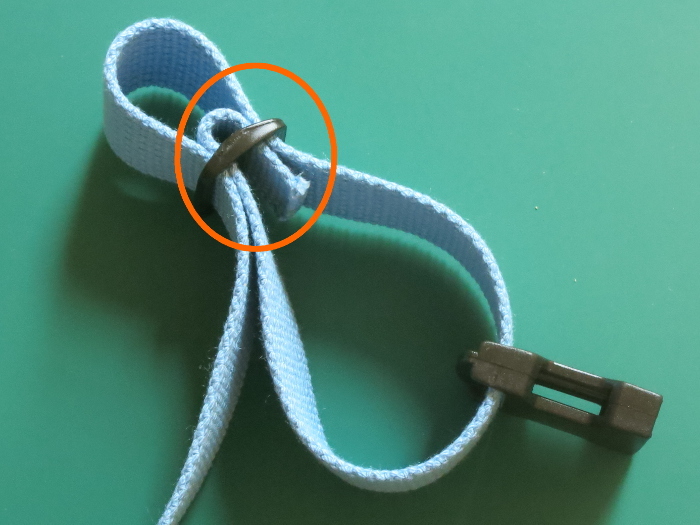 Once you finish sewing, pull the webbing to make the loop small. 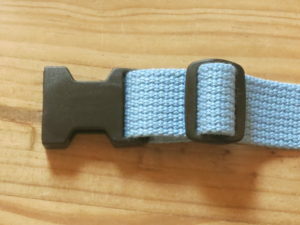 The buckle will be right next to the slider, as shown on the left. Repeat the last 5 steps with the other end of the webbing, using the second slider and the other piece of the buckle. With sliders and buckle pieces on each end of the webbing, you now have an adjustable waist band for your pouch. 7. 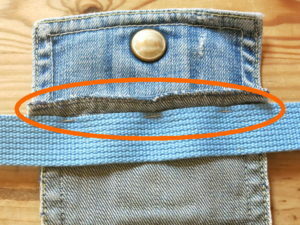 Place the pocket on top of the outside of the waist band, centering the pocket along the length of the band. Align the top edge of the pocket with the top edge of the band, as shown on the left. 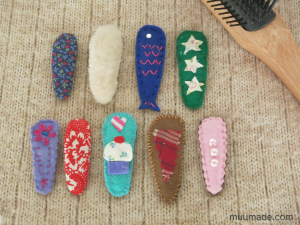 Pin the band and the pocket together along their top edges. The second image on the left shows the backside of the pocket. 8. 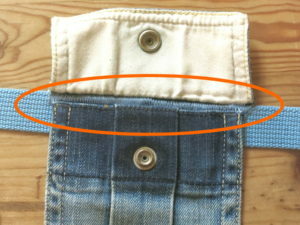 Sew the pocket onto the band along their aligned top edges. 9. 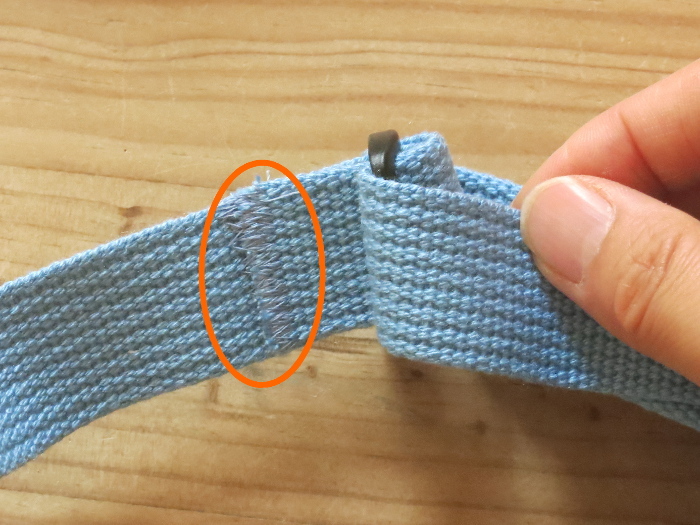 For the bottom edge of the waist band, you will need to do some hand-sewing (even if you used a machine to sew the top edge in Step 8). Here it is! 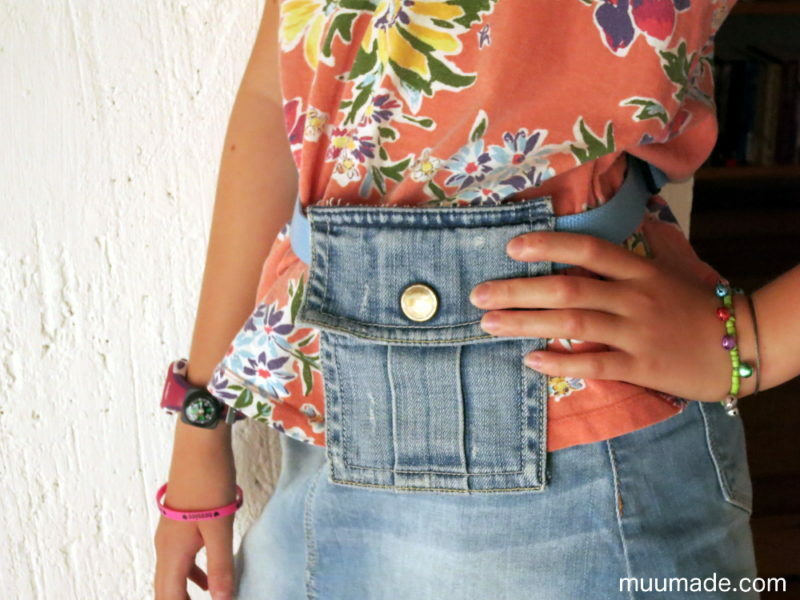 A cool upcycled pocket waist pouch with an adjustable waist band! This waist pouch can be worn as a stylish accent to your outfit over your shirt or dress. 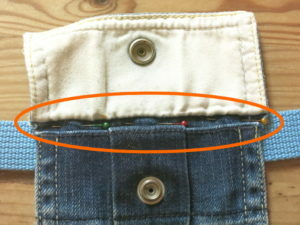 Or, as it fits tightly around your waist, you can wear it under your shirt to discretely carry around small items.